Please feel free to send us reviews and/or go to Facebook/Google/Angie's List... we'd LOVE to hear what you have to say- Thank you!! "Fast service, courteous staff, nice facilities and overall great appointment!" - Aubrey E.
"The service was excellent; the staff demonstrated a sincere interest and caring for our family pet. When the visit was concluded, there was a strong sense of continued commitment toward Lily's future care and well-being; and there was a strong sense of connection with with staff and Dr. Jones. Dr. Jones demonstrated nothing less than excellence in her willingness to go above and beyond in research, listening and obtaining satisfactory results" - Kay J. "What a kind and caring environment, with an attentive staff and thorough examination. Dr. Jones took her time and explained all of our options. Our dog was so comfortable here, and he has never been so comfortable at a veterinary clinic before. He was walking around and checking out the clinic and even took treats from Dr. Jones- usually he is too scared to do that!  We look forward to using Woodlake Animal Hospital for our veterinary care"- Emily S.
"We had seen two other vets and came to Dr. Jones for another opinion. Her recommendations of diet change and medicines and bathing has our dog feeling better and not itching for the first time all summer. We are delighted and so is our dog. Thank you, Dr. Jones and the wonderful staff at Woodlake Animal Hospital" -Dave S.
"Our cats love coming to Woodlake Animal Hospital. They can look out the windows and watch the birds while Dr. Jones is examining them and they don't even seem to mind the kittens that live at the clinic. They even purr while they are visiting, which they never did at our previous vet. Our cats are our children, so if they are happy, so are we! "- Heather C.
"My dogs have been getting acupuncture with Dr. Jones for three years now, and I am quite sure they have been with us this long because of the acupuncture and the care that Dr. Jones gives them. She even comes to our house to do their treatments, which makes it easier for all of us. I was skeptical about acupuncture in the begining, but now I tell anyone who will listen that it has made all the difference in our dog's quality of life" - Anne Y. "It was great, no complaints! Love it there!! "- Meghan R.
"Dr. Jones and staff made me feel so welcome and comfortable as soon as I walked through the front door. Dr. Jones answered every question I had about my two guinea pigs with great detail and clarity. Woodlake Animal Hospital truly understands and empathizes with pet owners! They took my guinea pigs in when my power went out over the summer and it was 85 degree weather (too hot for little piggies) I always enjoy each visit with Dr. Jones and look forward to the next one!" - Lisa P.
Fantastic! Dr. Jones always responds promptly to any requests and ours are usually serious. Even though we've moved out of state, she continues to be compassionate and responsive to our pets' needs. We cannot tell you how much this has meant to us. Thank you!- Kathy and Bob F.
I cannot rave enough about Dr. Jones. Dr. Jones has been the vet of my two dogs and two cats. Her ability to connect with my beloved animals is beyond description. One of my dogs is 100+ pounds, very intimidating bully breed that has trust issues (he was abused, he is a rescue). He connected immediately with Dr. Jones and has never had a moment of discomfort with her. For our family this is a very big deal - we have been to practices where he was could not get comfortable with the vet. He adored her immediately and he is putty in Dr. Jones' hands - it is a sight to see. Dr. Jones also treated my border collie mix with acupuncture for her hip dysplasia. The results were fantastic. The acupuncture process was not stressful on my bundle of energy and she readily accepted the treatments. Her improvement was extreme. I cannot express what a difference it made with her. Dr. Jones treats your pets exactly the way you want them to be treated - with gentleness, kindness and extreme patience. She takes her time, she genuinely connects (I know I keep using that word, but trust me, it is true) and she listens, to you and your pets. Her instincts are strong and she is easy to trust. She helped me deal with my 18+ year old cat with a multitude of medical issues in the kindest, most humane way possible, He was always comfortable but I never felt he was being "over treated. "- Karen J. So excited to have Dr. Leslie Jones close to home! She has made numerous house calls for my girls, "Chloe & Gracie" to administer their shots as well as a few other issues. I'll never forget one time inparticular when I was convinced one of my cats had lumps (cancer was all I could think) under her neck! She did a thorough exam and turned out to be something very simple! Considering my emotional state, she ended up having to tend to me rather than my cat! LOL! My husband says, "she's worth her weight in gold!" Hurray for Woodlake Animal Hospital...tell your friends!- Sara F.
Please see http://www.demandforce.com/b/woodlakehospital/reviews for more reviews of Woodlake Animal Hospital, or to leave your own!